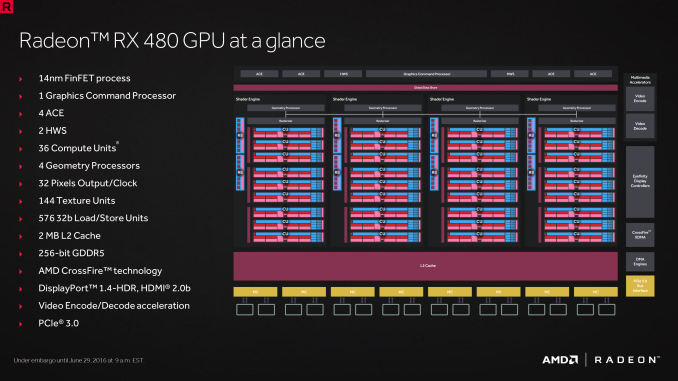 Back in December of last year, AMD’s Radeon Technologies Group began slowly trickling out the plans for what would be their first GPU architecture built for the now-modern FinFET processes: Polaris. As part of a broader change in how GPU architectures have been handled – more information is now released ahead of launch – AMD laid out what they wanted to do with Polaris. Aim for the mainstream, radically improve power efficiency, lay the groundwork for HDR displays, and, of course, improve performance. Now six months later we are seeing AMD’s plans come to fruition, as the Polaris GPUs are in full production, and the first retail products are launching today. Kicking off the Polaris generation in the desktop market will be AMD’s Radeon RX 480, which is aiming for the mainstream market. We’ve already seen the card, the price, and AMD’s marketing spiel back at Computex 2016, so now it’s time to take a look at the final, retail hardware. 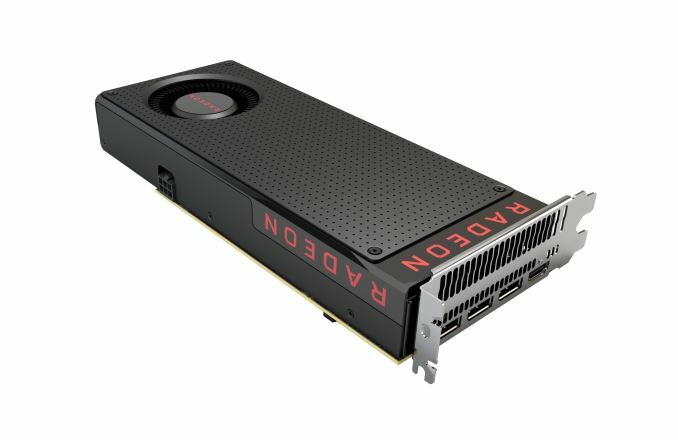 At the highest level, the RX 480 is based off of a fully enabled version of AMD’s Polaris 10 GPU. This is the first Polaris GPU to hit the market, and is the larger of the two GPUs. The total transistor count is 5.7 billion, which takes up 232mm2 on GlobalFoundries’ 14nm FinFET process. That this GPU is built at GloFo and not TSMC is a significant departure for AMD, who previously has used partner TSMC just shy of forever, and is the first time AMD and NVIDIA haven’t used the same fab in some 13 years. We’ll touch upon the foundry issue more in the full review, but the important thing to take away right now is that with the split in foundries, it’s no longer architecture alone that dictates whether a given NVIDIA or AMD GPU is better; process now plays a part, and the playing field is no longer even. As it’s using a full Polaris 10 GPU, the RX 480 ships with all 36 CUs (2304 SPs) enabled. Ignoring architectural efficiency for the moment, this puts it somewhere between the Radeon R9 390 (Hawaii) and Radeon R9 380 (Tonga) in terms of CU count, with AMD having spent a good chunk of their 14nm density gains on adding CUs. Note that the CUs themselves have not substantially changed – it’s still 64 stream processors and 4 texture units per CU – which is where the 144 texture unit counts comes from. On the backend of things, RX 480 is equipped with 32 ROPs. This is fewer than Hawaii’s 64 ROPs, but it is consistent with mainstream parts, as ROP needs don’t scale nearly as quickly from one generation to the next like compute (CU) needs. These 32 ROPs are paired with 2MB of L2 cache, which is twice as much L2 cache per ROP as the bulk of AMD’s last-gen lineup. The increased L2 cache has a die space cost – which is now easier to pay with the 14nm process – and helps to improve performance and cut power consumption by keeping more data on-die. However once you go off-die, you will run into RX 480’s VRAM, which is a small story in and of itself. Once again common for mainstream AMD cards, AMD has stuck with a 256-bit GDDR5 memory bus here. Attached to this bus is either 4GB or 8GB of VRAM, with AMD offering two capacities for RX 480. The reason for offering multiple capacities is that AMD wants to hit the $199 price point with the card – the traditional sweet spot for mainstream cards – which would be hard to do with an 8GB card at this time. By offering both, AMD can hit that price while offering a full 8GB card at a slightly higher price for buyers with a bit more flexibility and/or greater VRAM needs. Where things get tricky here however is the memory speeds. Officially, 7Gbps GDDR5 is the minimum speed for both RX 480 capacities, and this is the speed that AMD’s 4GB reference card runs at. However for their 8GB reference card, AMD has opted to ship the card with faster 8Gbps memory in order to further boost performance. I suspect that AMD would have liked to have used 8Gbps memory throughout, but the aforementioned price target required AMD to make some concessions to comfortably reach it. Otherwise for the higher priced 8GB card, AMD didn’t need to pinch pennies, and as a result they were able to ship it with 8Gbps memory. The end result is that we have an odd schism between AMD’s card requirements and what they actually ship. The reference 4GB RX 480 meets the RX 480 minimum specifications, whereas the reference 8GB card is de facto overclocked relative to those same specifications. As we’ll see in our benchmark results, the difference in performance isn’t too great, but I don’t think this is an ideal outcome for consumers. My biggest concern right now is what happens when AMD’s partners start shipping their custom cards; if they opt for slower memory buses, then this would mean that custom 8GB cards could end up slightly underperforming the official reference card. But we’ll have to see how that plays out. Moving on, let’s talk about power consumption. As AMD has made clear over the last several months, one of the major goals of Polaris was power efficiency, and this is where we see some of the first payoffs from that decision. RX 480’s official Typical Board Power (TBP) is 150W, over 20% lower than the last-generation R9 380, and 45% lower than the otherwise performance-comparable R9 390. Consequently the card only requires a single 6-pin PCIe power connector for external power, making it a more friendly option for power-limited desktops that don’t offer additional power connectors. In terms of design, the reference RX 480 is a double-wide, blower-style card measuring 9.5-inches long. 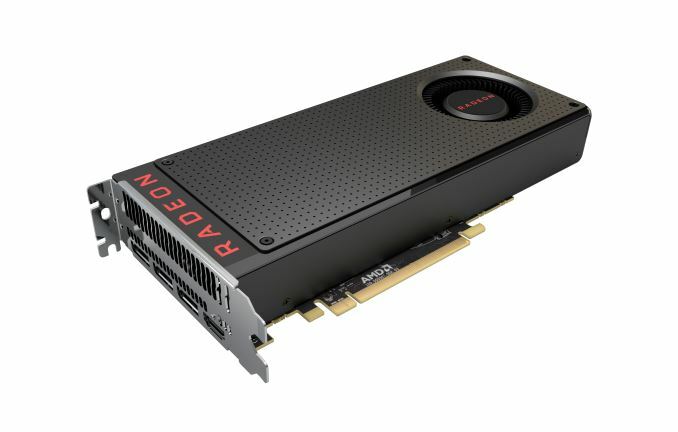 Notably, this is the first AMD retail reference card since the Radeon R9 290 series to use a blower, giving AMD the opportunity to show that they’ve learned from 290’s excesses and that the company can build a better blower. Given AMD’s mainstream ambitions, a blower makes a lot of sense for a $199, 150W card, as a fully exhausting card is going to be the most compatible with the wide variety of desktop designs out there. AMD doesn’t need to worry about whether the cooling built into the chassis can handle 150W of heat, since the card can remove the vast majority of the heat on its own. The blower design does add some length to the card though; the PCB is only 7-inches long, while the space requirements for the radial fan push the card out to the full 9.5-inches. For connectivity, buyers will find 3 DisplayPorts and an HDMI port; AMD has done away with the DVI port for their reference design. As this is a new card on a new architecture, both port types support their latest respective standards. For DisplayPort this means support for the 1.3 and 1.4 standards, adding the newest, fastest HBR3 signaling mode, along with full HDR support. Meanwhile for the HDMI support, HDMI 2.0b is supported, offering 4Kp60 support with HDR. For today’s launch, this is going to be a full reference launch. All of AMD’s partners are shipping AMD’s reference design in 4GB and 8GB capacities, which means the differences between the vendors will come down to pack-in items, support, and whether anyone charges a premium for the aforementioned items. Card availability is said to be good, but at this point I’m going to be surprised if most retailers don’t sell out by the end of the day, as these days it’s rare for video cards not to sell out, even mainstream cards. Looking at the slightly longer term, AMD isn’t able to state exactly when we’ll see custom RX 480 boards hit the market, but from what I gather it will be sooner rather than later. Moving on, with two different capacities there are two different prices for the RX 480. The entry level 4GB card will be launching at the previously unveiled price of $199. Meanwhile the 8GB card will launch at $239, a $40 price premium for the extra 4GB of memory and the higher memory frequency. I do not have a good idea of what the split is between 4GB and 8GB cards, but I suspect that it will be the 8GB cards that are more plentiful. Finally, looking at the competitive landscape, just as was the case last month with NVIDIA’s GTX 1000 series and the high-end market, the Radeon RX 480 series is launching uncontested into the mainstream market. At least for the time being all of NVIDIA’s products are positioned well above the RX 480 – with GTX 1070 starting at $399 – which means what competition there is for AMD is composed of last-generation 28nm cards, particularly the GTX 970 and GTX 960. As these are last-generation cards, neither one is strictly comparable to the RX 480, and in the long run these cards have a limited shelf life as they’re due to be discontinued sooner than later. 4 and 8gb are currently being released. "2 RX 480 CRUSHES GTX 1080 for $200 less!!!" 2) ~80W of that is from the PCIe slot itself. Motherboards are only required to allow 75W for ALL PCIe slots. Either way it will overload the traces on cheaper boards.